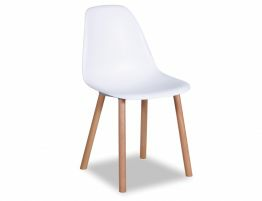 Our cleverly reinterpreted classic shell chair offers all of the design savvy of the Eames moulded classic DSW chair with the addition of light toned solid beechwood legs for a modern flourish. The Eames Eiffel chairs, staples of mid century modern, have been created with multiple bases in both metal and wood and now with our Canndale chair, you get an additional base option for this iconic dining chair. 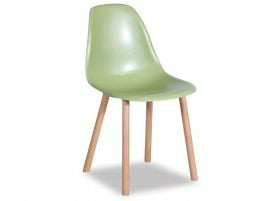 Created in the 50s, the shell style chair continues to be widely sought after for use in modern interior design. Our Canndale dining and accent chairs are available in a wide range of colours and we also have a wing chair model that is great if these are to be your dining chairs. Put the armless versions along the lengths of your dining table and the wing chair version at the table’s ends. Our Canndale moulded chairs make great modern dining chairs or attractive, accent chairs. The Relax House innovative original side chair, seen here in black, bring together the shell of an Eames with the base of Jasper Morrison’s Hal chair for a creative marriage of old and new. 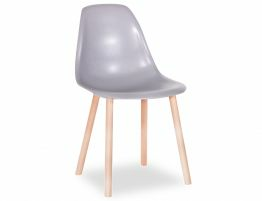 The Relax House Canndale chair features a shell moulded of ABS plastic and the smooth, formed shell sits atop solid Beech wood legs. The mix of the modernity of plastic and the naturalism of beechwood offers a study in contrasts. Put this stunning, modern black chair in your dining room or as additional seating on a living room. Or put this midcentury modern reimagined dining chair in your kitchen for a sleek, designer look.The Eames ‘Eiffel’ chair made its stamp on interior design for half a century with its clean, simple shape sculpted to fit the human form. Now with the addition of a contemporary beechwood base, this chair becomes something altogether new. Our abs plastic moulded chair is strong enough for both residential and commercial use and the naturally finished Beech wood base offers attractive stability. 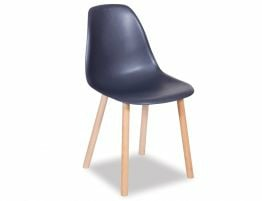 With a perfectly sculpted plastic shell seat, our Canndale dining chair makes a perfect kitchen dining chair and side chair. Relax House furniture proudly offers you, our design conscious customer, a new imagining of a revered classic. Get the side chair that is as unique as you are.